That might apply to Rep. Ilhan Omar. The woman just keeps putting her foot into her mouth — most often, about the Jews. Rep. Ilhan Omar called White House senior policy adviser Stephen Miller a “white nationalist,” amid a string of tweets decrying the Trump administration’s hard-line immigration reform policies. That’s not going to fly here. Last time I looked, the members of the Coalition live in the United States, making it impossible for Bibi to be “their” prime minister. While Trump might assume that the members of the Coalition have a particular fondness for Bibi, he cannot accurately say that about the overwhelming majority of American Jews. And now, the Republican Party is weaponizing accusations of antisemitism. Even and especially where it does not exist. Frankly, I think that we throw words around a little bit too easily. It reminds me of when I was in my teens and early twenties. Everyone called Richard Nixon a “fascist” and a “Nazi.” He wasn’t, and the rhetoric was inappropriate. The same is true with “white nationalist.” There was a time when we reserved such designations for men and women in hoods and sheets, and their ilk. Now, of course, they are more likely to show up in chinos and knit shirts. In any case, I don’t believe that name calling is the most appropriate way of dealing with these issues. 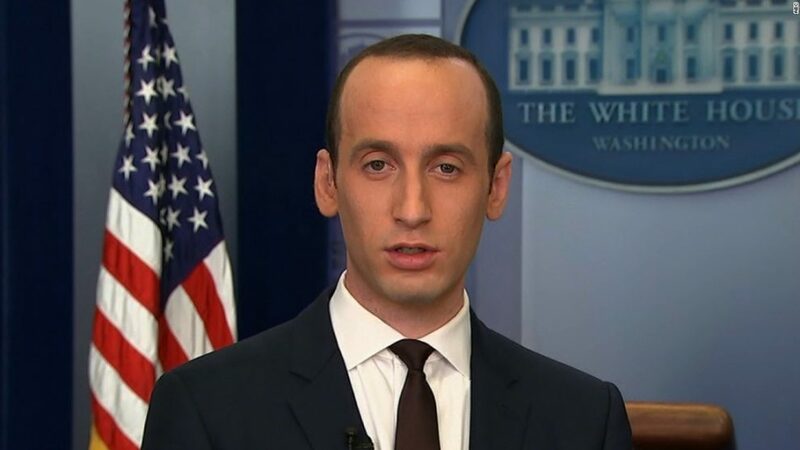 As for Stephen Miller: he might, or might not be, a white nationalist, or subscribe to their tenets. But, at the very least, Stephen Miller should know something — as should the members of the Republican Jewish Coalition. They sat blithely by this past Shabbat, listening to “their” President actually say that there is no room left in the United States for immigrants. Notice that the President did not say: we have no room for undocumented immigrants. He simply said: we are out of room. Period. End of story. The members of the Republican Jewish Coalition sat there, listened, and applauded. All I can say is: it’s a helluva way to mark the eightieth anniversary of the voyage of the St. Louis. On May 13, 1939, the German transatlantic liner St. Louis sailed from Hamburg, Germany, for Havana, Cuba. On the voyage were 937 passengers. Almost all were Jews fleeing from the Third Reich. That ship could find no port in which to dock. Sailing so close to Florida that they could see the lights of Miami, some passengers on the St. Louis cabled President Franklin D. Roosevelt asking for refuge. Roosevelt never responded. The State Department and the White House had decided not to take extraordinary measures to permit the refugees to enter the United States. A State Department telegram sent to a passenger stated that the passengers must “await their turns on the waiting list and qualify for and obtain immigration visas before they may be admissible into the United States.” US diplomats in Havana intervened once more with the Cuban government to admit the passengers on a “humanitarian” basis, but without success. The irony was lost on the RJC, apparently. As was, suddenly, years of their supposed Jewish education. A Jewish education that Stephen Miller, also, had experienced. So, no: Rep. Omar was hardly targeting Jews in her statement. She was targeting Stephen Miller, and those who would agree with him. Who happens to be Jewish. There was nothing antisemitic in Rep. Omar’s statement. To claim so is to buy into this ideological tug of war that involves the American Jewish community. I am not having any of it. I invite you to reject it, as well.